Mfg.& dist. by Macola Record Co. This record is not very good. I give it 1 star out of 5. This record is worth at most $5. 4 stars given for the dope instrumental 'Wolfin'. 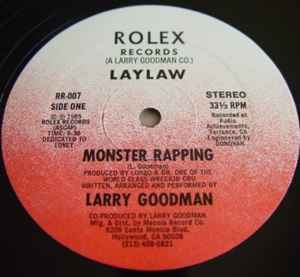 The 'A' side Rap version is really, really bad - reminds me of 'Monster Mash' LMAO! This nice record on Rolex records is another early Dr. Dre Production. Together with another World Class Wreckin Crew member, Lonzo, he produced this fine Electro tune. Really rare and hard to get. The record sounds like a World Class Wrecking crew track, also a little bit like Unknown Dj stuff, in this case I would say similar to Beatronic. But now a special tip for those who owns the record, listen to this record on 45rpm, you will see that this record sounds even better! It definately don't sounds to fast as the song is very slow. I have found my first copy many years ago, and I always thought that they maybe made a mistake in showing 33rpm, I have no idea! Give it a try and put the record on the wheel and listen to it on 45rpm, like having a new record LOL.